Having the oil changed regularly in your vehicle is just one of the necessary requirements to keep your car in good working order. You are going to have to do it anyway, so why not take advantage of a discount when it is offered? Valvoline Express Care is an automotive service specialist in Brampton, that can take of all your car maintenance and repair needs. With well over 20 years experience serving customers in the GTA, you can expect the same excellent service and results every time you visit. Aside from the premium service, there are also a collection of quality products to choose from for your vehicle, like a wide selection of motor oils, filters, wipers, and other accessories. You don’t even need to make an appointment first, just roll in and the qualified technicians will be at your service. Valvoline Express Care is located in Brampton, but services car owners from the entire surrounding area, including Mississauga, Toronto, Vaughan, Oakville, Etobicoke, etc. 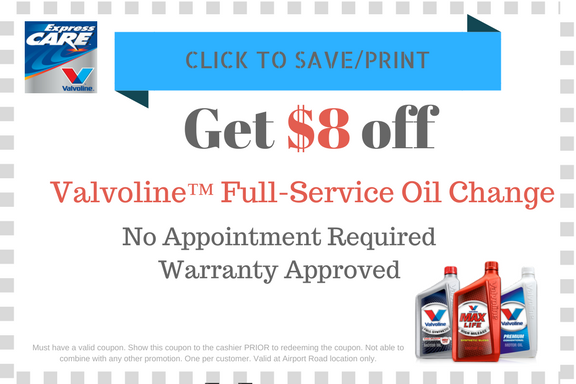 There are also coupons available at Valvoline Express Care that can be used for discounts on the many services offered. To qualify for the discount, you simply need to download the app for immediate access. The expert technicians at Valvoline can also help assess what services would be most beneficial for your automobile to keep it functioning at a high level. Regular maintenance not only improves vehicle performance, but it also helps retain the value of your car for when it comes time to sell it. Oil changes are a great example of how and why consistent maintenance is recommended. For the best oil change services in Brampton, Valvoline Express Care is your spot. Although the exact timeline does vary from vehicle to vehicle, the general consensus is that your oil should be changed every 5000 kms or so. Different vehicles will have different recommendations and the conditions you drive in on a daily basis are also a factor. Your owner’s manual will have all the details about regular scheduled maintenance. Why are Oil Changes Needed? If you don’t care about your car’s performance, holding its value, and avoiding large mechanic repair bills, then you probably don’t worry to much changing the oil. However, if you do want your car to last longer and keep its value, then consistent oil changes are a must. Car engines consist of an intricate network of moving parts. All these parts will inevitably rub against each other creating heat and friction. Oil helps lubricate these components to reduce friction and keep the engine running smoothly. As mentioned above, without proper lubrication the components in the engine would deteriorate quickly and significantly. Also, as time passes oil starts to become contaminated with dirt and sludge. This can cause corrosion and engine breakdown. Old, dirty oil does not provide the lubrication needed to prevent excessive friction for the engine components. Too much friction can create extreme heat in the engine and can damage the components. This makes the engine work much harder than necessary. If this continues for a prolonged period of time, you are looking at serious damage that is costly to repair. Less friction means a more streamlined ride, which can improve your gas mileage considerably. New cars are expensive. Avoid having to purchase a new vehicle due to neglect for the one you’ve got. Regular maintenance equals increased longevity and decreased spending for big ticket items.